When walking around the Boulder City Golf Course clubhouse, it’s hard not to notice the awards adorning the walls of one of the first golf courses in Southern Nevada. The course’s front nine were established in 1972, and 13 years later, in 1985, the course’s back nine were designed by former PGA golfer Billy Casper and golf course architect David Rainville. Casper and Rainville were the men responsible for turning the course into a 6,600 yard, par 72 layout. Tony Fiorentini, the head golf professional at the course for 20 years, said the customer base is evenly split between locals and players from over the hill. “Forty-five percent of our market comes from Boulder City, 45 percent comes from Las Vegas (and Henderson), and 10 percent comes from people from out of town (tourists),” Fiorentini said. The Boulder City Golf Course was named the “Best Bargain Course in Southern Nevada” for three years in a row, from 2001-03, by the now-defunct Vegas Golfer Magazine. The course hosted numerous tournaments and events, but that has tapered off. It is hard to tell how much of that is the product of the economy, or the opening of the 27-hole Boulder Creek Golf Club in 2003. Not only is this traditional 18-hole course an attraction to locals, but to celebrities and big-name athletes. Nick Watney, who is ranked 58th on the PGA Tour, recently stopped by to get some play on the course. Hall of Fame basketball player Bill Russell has also been known to play. Hall of Fame baseball player Rollie Fingers, a close friend of Fiorentini’s, also plays the course. However, with Boulder Creek only two miles away, the Boulder City Golf Course has had to lower its rates to lure players in. Early morning rates for residents at Boulder City are $30 Monday through Thursday, and $35 on weekends. Clark County residents pay $35 every day while noncounty residents pay $40. Boulder Creek charges $45 for early play, $55 for county residents, and $75 for nonresidents. When Boulder Creek Golf Course opened its doors in 2003, it took a lot of business that the Boulder City Golf Course relied on. The downturn in the economy didn’t help either. According to Fiorentini, when the economy went into a recession in 2009, golf play declined all across the United States, not only at Boulder City Golf Course. However, Fiorentini realizes that things are starting to look up. “When 9/11 happened, it kinda changed things — businesses went down,” he said. “For a year nobody traveled. Then you’re kinda getting over that and then things were starting to get better in ’06 and ’07, things were starting to snowball. 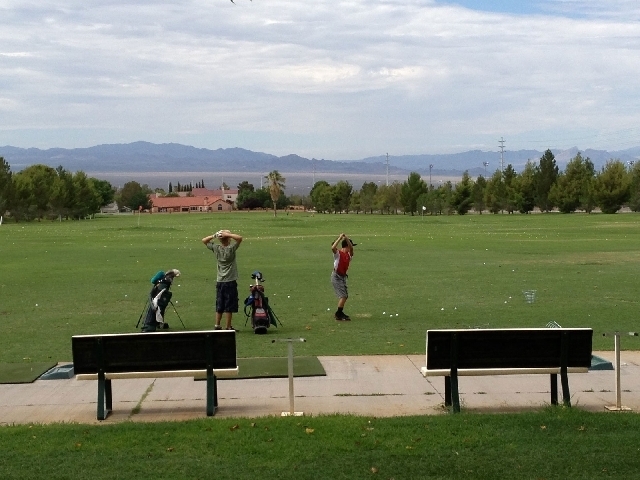 Boulder City saw 4,014 rounds of golf played in May, a 12.3 percentage increase from the same month last year. However, it is down nearly 1,400 rounds from May 2007. Overall revenue is down 3.7 percent to $863,000 through May, the first 11 months of the 2012-13 fiscal year. The course saw an operational loss of $80,000 the first 11 months of the fiscal year. No matter the economic conditions, Fiorentini says the golf course will continue providing a quality place for golfers to come enjoy and play the game.